The Belstaff leather jacket is a British icon that was born in Staffordshire and has integrated itself as Hollywood’s leather jacket of choice. Now I will be honest, these are no cheap leather jackets off the shelf, but with some deals to be had you may be able to find yourself a cult jacket for a reasonable price. Either way these jackets are all built to extremely high specifications and you can be sure these will probably last you a lifetime. Here we look at three of our favourite Belstaff jackets and their claim to fame. The Belstaff trailmaster legend jacket is probably the most famous Belstaff, the effortlessly stylish jacket was made famous by actor and all round motorcycle enthusiast Steve McQueen in the 1960s and the film Bullitt. The Belstaff company actually bought the original jacket that Steve wore in Bullitt for over £34,000. This double breasted wax jacket has buckles at the waist and neck to keep out the wind and features matching distinctive metal popper fastenings. An enduringly classic style, men of all ages will feel like action heroes in their own trailmaster legend jacket and will be ready to tackle adventure after adventure whatever the weather. 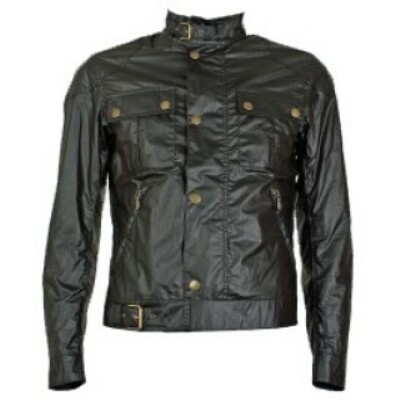 The Racemaster Blouson is a sleek and stylish jacket which is an excellent all-rounder, no matter what the occassion. Not only will it keep you warm and dry but it also looks great teamed with jeans and boots for a night on the lash and because of the smooth lines and shaped fit it’s great for showing off your physique (or not…) if you’ve been putting in the hours down at the gym. The fame of the Racemaster Blouson comes from the man that is Christian Bale, who chose the jacket in Batman – The Dark Knight – his was a multi-toned version with a red stripe to represent the dual personality of Bruce Wayne. Close-fitting and double breasted the Racemaster Blouson has plenty of pockets for the essentials, as well as slim versions of the trademark belts at neck and waist to keep out the cold and rain. 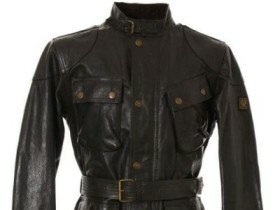 Finally we come on to the Belstaff New Panther, made famous most recently by Brad Pitt in the film Benjamin Button. 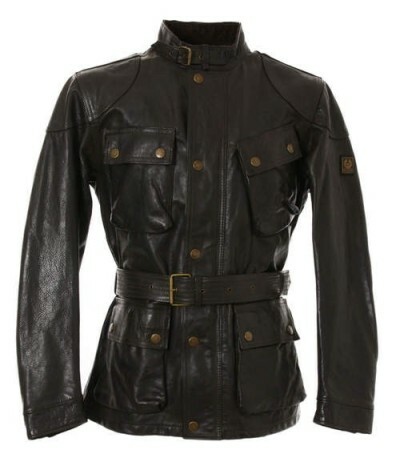 Pitt wears a dark brown version of this Belstaff while he rides his vintage Indian motorcycle through Louisiana. The rugged appearance of this classic jacket just screams classy retro and is very much compliments the Brad’s own individual style. He apparently owns (probably given) a number of Belstaffs which he wears casually too. The name is taken from the wild cat itself, being sleek and tough in design. It’s a truly durable piece that keeps its wearer warm and dry without being to bulky. 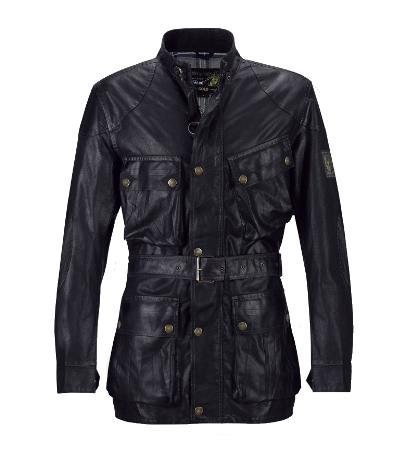 One of the longer length jackets from the Belstaff range it features the classic Belstaff belting and checked lining. There we have it, overall we love the Belstaff Jackets, with their heritage, quality and overall look they really are a must have if you are looking for a classic jacket. While everyone is buying their fake barbour to fit in, it’s about time you tried to become a little different. Thank you to Belstaff at Accent Clothing for the jackets and details, they are one of the few UK stockists for Belstaff Jackets plus other ranges of high quality designer menswear.